We are a group of architects who believe that education is a universal right, so we decided to embark on an adventure together and build schools in remote villages. Our first mission began in Senegal, Africa. We build schools in underprivileged areas across the world using sustainable and locally sourced materials. We research and implement innovative and low-cost construction techniques, which can be adapted to diverse sites and require little or no construction knowledge. We focus on finding construction techniques that are affordable, user-friendly, and do not require specific construction skills. We use locally sourced and readily available materials. Our long-term goal is to benefit local communities by empowering them with new skills and building methods that are practical and cost-effective, and that can be replicated independently whenever required. We investigate the needs of the village. We identify the available materials on site and explore possible techniques of construction suitable for the climatic conditions. 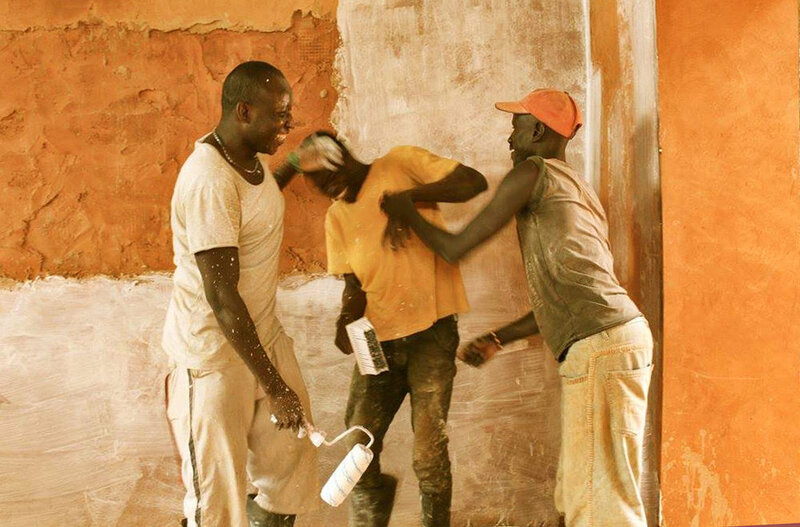 We share the construction process with the local community so they can build with us, and replicate as required. We build the school and classrooms together and deliver a fresh environment to teach and learn. We use local materials to build the most suitable structures for the climate and environment we are in. We design thick walls made of available material such as soil, sand and clay, which have beneficial thermal qualities and keep the classrooms fresh. We create window openings large enough to let the air in and out of the classrooms. We build the roofs at an elevation from the walls, leaving a significant gap for natural ventilation and light. These simple design techniques help overcome the overheating issue in existing schools: blockwork walls, small windows and zinc roofs create a very difficult environment for students and teachers, affecting their ability to perform and succeed. Our goal is to spread a construction technique that is fast and easy to pick up, and which will create a great atmosphere to teach and learn. We team up with the local community and global specialists to conceptualize sustainable and ingenious methods. We tested both the sand-bag and tyre construction techniques on site in Senegal to determine which materials are best suited for the local community and environment. Trials proved that the best approach is to build the classrooms using tyres for the foundations, and sand-bags for the walls. A protective outer layer made up of a sand and 8% cement mixture was applied to the sand-bag walls. This became the primary construction method of the foundation and walls for the school we built in Keur Racine.